A Series Based on Low-Buck Econoboxes? Anyone who has watched or competed in a single-marque series like Spec Miata or Spec E30 understands the level of excitement they inspire on both sides of the fence. When the starring cars are sporty cult classics like the Miata and 3 Series, it doesn’t take much imagination to envision huge fields battling it out for the podium. But what would happen if there were a series based on low-buck econoboxes? When Nissan Canada announced that the Nissan Micra would return to the Canadian market with a price of less than 10 grand per car, longtime automotive journalist and former Honda Michelin series competitor Jacques Deshaies knew the time had come for a repeat appearance of grocery-getter madness. Putting pen to paper, Deshaies realized the fabricators could build complete race cars that could be retailed for about $20,000. Deshaies immediately presented the idea to Nissan Canada’s corporate communications boss, Didier Marsaud. His enthusiasm was expected: As a younger man, the Frenchman was a motorsports pho- tographer and journalist who covered the Dakar before joining the Renault competition team. What wasn’t expected was that Nissan Canada’s president, Christian Meunier, would be equally as enthralled and approve it almost instantly. Throughout 2015, the series won Quebec racing fans by the thousands. The competition was so close, some international journalists wrote that the Montreal Grand Prix round was the highlight of the Formula 1 weekend. It helped that the young guns who came up from karting had some stars to challenge themselves against during the season. Among them was Canadian racing legend Richard Spenard, who proved, despite being 40 years older than some of his rivals, that he was still lit from within by the fire of competition. The series announced that, starting with the 2016 season, its schedule would grow from six race weekends to eight and that three of those would be held in Ontario. 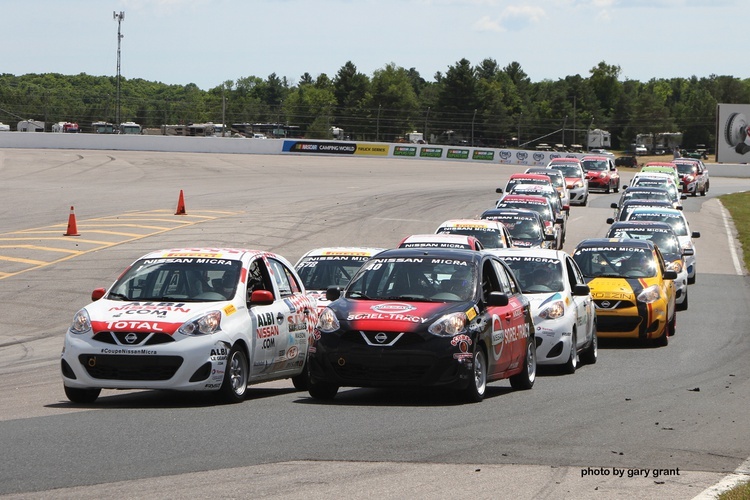 Finally, for the first time, the Micra Cup would make a stop at the legendary Mosport circuit, now known as Canadian Tire Motorsport Park. Safety equipment aside, the race mods are very minimal. The tiny hatchback receives a Nismo S Tune Suspension Kit, which includes upgraded springs and struts, Nismo front brake pads, Pirelli slicks, and upgraded wheels from Canadian company Fast Wheels. Like the current iteration of the Mazda MX-5 Cup, every Micra racer is built by a single shop, ensuring that the copies are as close to identical as possible and eliminating any competitor- induced hanky-panky. While Canadian race fans are legitimately excited about the Micra Cup, enthusiasts south of the border haven’t had much to talk about: Nissan USA has chosen not to import the Mexican-built Micra to the States. However, Deshaies says that SCCA officials have recently been pushing him to bring the series south for a few exhibition races. Deshaies hap- pily admits that some events in the Northeast (think Lime Rock or The Glen) might be a perfect fit for the 2017 season. The series has made good use of a media car program, and during the week of the Mobil 1 Sportscar Grand Prix at Canadian Tire Motorsport Park, I had the opportunity to strap my rather round frame into one of the race cars for a test session. It was the first time I had driven on slicks in decades, so I was cautious to build heat in the tires while getting a feel for the car’s limits. My initial thought was that the sticky tires were overwhelming the mild suspension, as the car squirmed like a ’69 Caddy at low speeds. Building speed and confidence, I quickly learned why I captured so many photos of these cars on two wheels last season: That’s the only way to rotate them. Once you realize this and start hooning the car, jumping it over apex curbs, the Micra comes to life, practically begging the driver to make it fly. 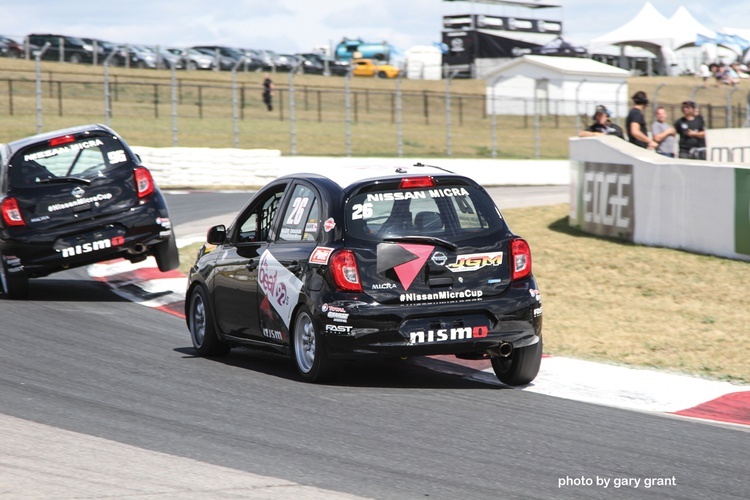 Of course, the ragged-edge driving style needed to make these cars fast, coupled with a field of ultra-competitive racers, means that body repairs are frequent in the Micra Cup. Fortunately, body panels for these machines are just about the cheapest on the market. Toyota did the same thing with the Echo hatch when it first appeared in Canada, called it the Echo cup. Good idea, but $20k for that car? That sounds nuts to me. I was just talking to a guy who sold an podium e30 for Chumpcar/AER with a spares package for 14k CAD.. < 20k for a new racecar sounds like a good value.. I guess I'm the only one old enough to remember Renault Cup racing. Laps around Road Atlanta timed with an hour glass. I'm old enough to remember Honda Canada sponsoring the Honda Challenge in the late 70s, with the original Civics, bog stock. It was hilarious racing - tires howling, bump drafting, cornering on 2 or 3 wheels, brakes going away. It was much closer and more intense competition than in many of the 'senior' series, much the way all the iterations of Spec Miata are a couple of generations later. What ever happened to the Bspec class ? I have a friend who raced in the Renault cup. How do you fit $10k in mods in an econo box class like that? DIY race car build = $1100 Spec E30 donor plus suspension, wheels, tires, cage, seat, etc and doing the work without paying anyone for labor I wound up with between nine and ten grand in the car. So yeah, if you are starting with a ten grand car and paying someone to do just the cage and safety mods you will easily be there. BSpec isn't dead, but the Pro Series that tried to run them made sure the entry and tire bills from each weekend made you wish you stayed home. $20k for a brand new racecar isn't bad, when you consider top flight spec miatas are selling in the $30-$40k range. In the Pirelli Cup, there's a class called Touring Car B that is what Bspec was. I doubt it will last that long, since the cars are not really market supported much- we've even said the Fiesta is being taken out of North America. $2500 in labor (only one shop builds each car). Seems pricey that the racing kit doubles the price of the car, but when you think it makes a turn-key car, it doesn't seem nearly as bad. I love the idea of the series because it also seems to make very close racing. I enjoy when there are a pack of cars dicing for the lead rather than one or two and the rest scattered throughout the field. Given the overall speed, though, seems like the would be must more fun and entertaining on shorter tracks vs. long tracks (like COTA) where corning ability and speed are critical. ^^^That’s one reason why crap can racing never made much sense to me. The cost of race-prepping a car is not that different whether you’re starting with a pristine E30 M3 or a clapped out Tercel. The cost of consumables (tires, brakes) isn’t that different either. And, of course, entry fees, travel, and hotels are the same no matter what. Running a few sets of 200TW street tires divided by 4-6 guys is way cheaper than going through at least 1 set of sticker Hoosiers per weekend when you're footing the entire bill. I can almost guarantee you that crap can racing is cheaper than more "serious" racing. Compare apples to apples and look at the cost to run an endurance race weekend in two different series. A Lemons race can be had in a competitive car for $4k-$5k/weekend, split among 4-6 drivers, all in - tires, fuel, entry fees, everything. No way you're running 16-24 hours on track for that much in an E30 M3. Do you have a point of comparison? I've had SCCA guys say similar things - why race crap cans, I can race in my Acura for a similar cost - and they were talking basically sprint races compared to a Lemons race. Minutes of track time compared to hours of track time. Not to mention the car build itself, for the first event, is usually around $5k. Give or take depending on levels of speed and cheatiness desired, of course. Additional events are just repair / upgrade costs like any series. I guess I don’t see how the build can be $5k unless you’re fabricating everything yourself. A proper cage from a decent builder will be $5k alone. And it’s not like Recaro, Schroth, FireSense, etc. are giving you discounts for installing their products in a Yugo vs. a Porsche. Safety equipment costs whatever it costs. More important, I’m not comparing sprint races to enduros. That would obviously be a silly comparison. If you want to run in a series that restricts costs by making you run street tires, etc. then I’m all for it. But I’d rather start with a chassis I’m more excited about. I’d totally run my 190E Cosworth or new Triumph TR6 project in a low-budget endurance race ... but those cars cost me $3-4K to buy (not $500-1500). Once you’ve spent the time, money, and/or energy to turn them into race cars, paid for consumables, entry fees, hotels, transportation, etc. etc. the price difference between them and a Yugo is pretty much negligible. A cage doesn't cost anywhere near that much to have a pro do it, there are other rated safety products that aren't Schroth or FIA rated Recaro's etc. It's always obvious who has and hasn't priced things out and who is exaggerating for the sake of making a point. well, as these are meant to be a factory backed series, I am sure they are using top brand gear. better to be safe than to get sued because something that was not A+++ failed. Factory backed stuff also tends to be "flashier" in regards to name brands. Just looking at the stickers on the two cars at the top of this article. I see Perilli, Hawk, FAST, Nismo (of course) and a few others that I cannot make out. A Lemons cage runs about $1500-2000 and is the single most expensive part of a build, though many people do install them themselves and a kit costs around $400 from Roll Cage Components. And most people racing Lemons do not use Recaro or Schroth hardware. You see a lot of Kirkey and Racequip stuff. For example, a Racequip SFI camlock 6-point harness is $150. There have been some 190e Cosworths in Lemons. I imagine they were bargains that then had parts sold off. One won in Alabama the only year I got to run at Barber Motorsports Park. They sure are fast and sound fantastic! The team I met locally spent 1700 on the cage for their 3rd gen camaro. The only people who compete in series like the above are young and rich people who are looking to build careers and get to drive in better/faster series down the line. lol, I read the title and was gonna say "it's currently being done with the Micra Cup"
I paid $4k for my cage and felt it was a good deal considering the number of hours involved. Folks I race with generally have nicer cages than mine ... and paid more for them. From what they tell me, $7-10k is not unheard of. One thing I've always valued about GRM is the collegiality. Your post is more mean-spirited than I would have expected around here. I used to see those Honda Michelin series cars at Mosport in the 80s, and you're right, they were a riot to watch. They were often the most entertaining race of the weekend with 6,7,8 cars freight-training through corner 2. Most of the gripes here are quoting DIY costs and comparing it to crapcans and used cars. $20K for a factory built BRAND NEW turn key racecar with engineered everything is cheap! Considering the ND cup car is like 55k and thats considered a good deal yeah. The power and weight of the Micra is about the same as my ITB VW GTI was, back in 1996, and I had a lot of fun racing that car. Only issue I have with the Micra build is the fact that the cages are bolt-in. I've always preferred a welded cage, but I have no real reason why. That too, but I think it's a what the market will bear thing. I've built a lot of cages and should have a good idea what one would cost, but I once heard a rally wannabe tell another one that a cage alone was $5k. I laughed at that, then I saw what those guys pay for stuff. Zomby Woof said: I've built a lot of cages and should have a good idea what one would cost, but I once heard a rally wannabe tell another one that a cage alone was $5k. I laughed at that, then I saw what those guys pay for stuff. Most people (like me) don't do their own custom fabrication work and have to pay someone to put a cage in the car. A custom-made cage costs pretty good money at a reputable race/rally shop (especially if you're adding labor to remove the dash, paint the cage, etc.). Like most people, I don't have the time, skill, tools, or space to fabricate the kind of cage I wanted for my racecar. Quotes I got ranged from $3500 to $6000. It seems you guys are talking about putting together pre-fabricated, bolt-in cages. I'd expect them to cost much less. You can still find good deals. I bought my '87 about 7-8 years ago. Clean, rust-free, accident-free SoCal car. I paid $4000 and immediately recovered $1000 when I sold the horrid chrome Lorinser wheels that came with it. Since then, I've bought a couple of complete cars for $2000 (drivable) and $1500 (parts car). There's a complete, low-mileage 190E 16v for sale in Arizona right now. Black with 5-speed gearbox. The owner is asking $1800. The paint is sun-burnt and it needs work to run (sounds like CIS issues). But it would make for a solid project. LanEvo said: It seems you guys are talking about putting together pre-fabricated, bolt-in cages. I'd expect them to cost much less. I built them from scratch and they weren't 6 point cages, either (those I could build in a day) but if it were for something like the Micra, it should be even easier, having the jigs and already having built a number of them. wow.. the 10 grand price to turn a car from street to strip really brought out some Interesting points from people here. I can't say I was expecting that. Not bolt in; none of the capcan racing series accept bolt in cages, at least not any more. An $1800 190e would be a blast. Some of the prices seem a bit steep. But I too believe 4k is a good average for a cage. Nope, and I already said as such earlier in the thread. In reply to mad_machine :like all low cost entry level series cost will grow. Formula V, Formula Ford, heck even Formula Jr were all low cost entry level series that got out of control. I’ll have to call you when it comes time to put a cage in the TR6 project! To me, making a $10k car into a $20k car is completely missing the point, but I've often thought that rally is kept unnecessarily expensive just to keep some people out of it . It's definitely the most cliquish (I'm being nice) form of racing I've ever experienced, and I expect this is no different. yes, because people kept chasing 1sts at ANY cost. That is the benefit of a series like this, all the improvements are in the driver as the care identical. I wonder if they will make the fastest drivers use the slowest cars? In reply to mad_machine :That's exactly what they said about all the other low cost series. Turns out there always will be production variations and if you buy enough parts you get to pick the best ones to put things together.